OurEnergyPolicy.org | Will the Bonanza of Cheap Natural Gas Postpone the Transition to a Clean Energy Future? Thanks to breakthroughs in seismic imaging, horizontal drilling and hydraulic fracturing, the US in 2012 reduced its reliance on much dirtier coal by shifting to gas-fired power plants. This trend is expected to continue, spurred by low gas prices and increased regulation on coal. The move to shale gas is being heralded as a key to economic prosperity and a clean energy future. But there are other options for displacing baseload electricity from retired coal plants, the principals being nuclear, renewables and energy efficiency. Will the gas bonanza enable or postpone the transition to these cleaner options? While natural gas produces half the CO2 emissions of coal and emits relatively smaller amounts of nitrogen oxides, it is more polluting than nuclear power, which provides nearly carbon-free energy, and it is more polluting than most renewables as well as the cleanest source—energy efficiency. A glut of cheap gas could shelve investments in these alternatives and could encourage consumers to use more energy, slowing the conversion to more efficient appliances, motors, and energy-smart equipment. While the US is expanding its natural gas industry, it is also advancing its nuclear fleet. Operating reactors are being made safer in the aftermath of the tsunami-triggered disaster at the Fukushima Daiichi plant in Japan, and the industry is investing in a next generation of more secure reactors, led by utilities in the Southeast including the AP1000 project at Plant Vogtle co-owned by Georgia Power. Lacking a federal repository for nuclear waste, utilities must use on-site storage for their spent fuel. A long-term storage solution is still a national need. The economic and policy uncertainties are considerable. Natural gas prices are volatile, nuclear construction costs are difficult to predict, wind and solar technologies are advancing rapidly, and the demand for electricity could remain flat or heat up. Policymakers may decide that CO2 emissions should continue to go unpriced, or they may regulate or tax them. With so many risk factors, how should utilities respond to the glut of cheap natural gas? Utilities face the imperatives of affordable electricity, environmental stewardship, and secure and reliable power. Remaining flexible and nimble is going to be a secret to their success. Shrinking the historic dominance of coal by expanding gas, nuclear, renewables and energy efficiency is the multi-source solution. History has shown that single-source energy approaches are fraught with risk. How should policymakers address the phenomenon of cheap natural gas at this time and its implications for alternative energy sources? 11 Responses to Will the Bonanza of Cheap Natural Gas Postpone the Transition to a Clean Energy Future? Incentivize industry and academics to solve problems. Stop subsidizing corn for ethanol and other pork barrels and spend the money helping proven enterprises succeed without bureaucratic roadblocks. Or, keep on having vitriolic firebrands on all sides of the discussion kick the can down the road. We are apparently becoming very good at this. For my children’s childrens sakes, I hope a bunch of smart people can find answers that address all legitimate concerns and do so in the realities of today’s energy landscape. Ms. Brown article is both moderate in tone and content. But I am less sanguine than her about utilities being able to significantly rely on either nuclear or renewables in the very near future. Nuclear power, if it develops, will develop slowly given political constraints and related public fear. Demand for renewables will increase but the increase may be rapid statistically, given relatively low base, but in terms of actual power delivered , given technological, infrastructure and locational constraints, the increase likely will be modest. Efficiency should be encouraged, but all the studies I have seen, bounce around, concerning results. The answer to the policy question asked above is simple, in principle. It’s the same as it has been from the time we recognized that the atmosphere is not a limitless sink for fossil carbon emissions. We must burden all fossil fuels with the full external costs of using them. That includes, importantly, a realistic cost to capture and sequester the fossil carbon released in burning them. If natural gas, honestly burdened with its external costs, can still deliver energy more economically than renewables, then so be it! What matters is arresting the rising level of CO2 in the atmosphere. Of course, one of the external costs of consuming a finite, non-renewable resource is that it is then not available to future generations. A substitute or substitutes will have to be found. So it’s fair that the tax on fossil fuels include not just the cost for capture and sequestration of its carbon, but also an amount allocated to development of alternatives. There are, of course, plenty of thorny issues and practical realities that any actual policy legislation will have to deal with. Carbon capture and sequestration will entail a great deal of capital investment and infrastructure that cannot spring up overnight just because fuels are being taxed for the expected cost. That cost itself is impossible to project with any reliability, and it will change over time and with deployment of new technology. Fuel taxes collected initially will need to go into a fund earmarked to fund actual capture and sequestration; otherwise the moral justification for the tax is lost. It becomes a “sin tax” used as a general revenue source for government. The external costs for which the tax was levied go un-remediated, and the government effectively becomes the polluter. Plenty of details for the devil to hide in, in the formulation of any actual policy legislation. Lower cost natural gas will not effect most renewable energy deployment. The cost of natural gas has a primary impact on new central station power plants and only in regions with natural gas pipelines and with natural gas pipeline capacity. Distributed solar, small wind and modular biomass markets will be unaffected. Most geothermal energy regions are also in areas with low natural gas pipeline density. Large photovoltaics installations offset higher peak and season electric power generation, not usually new natural gas generation. And large wind farm projects are driven by the need for incremental power, not 24 hour electric generation from natural gas plants. Natural gas has cut coal electric generation from 50 percent of US generation to below 37 percent and will also cut old petroleum peak power plants. Lower natural gas prices have essentially stalled out new nuclear power plants, because of their extremely high capital costs and high O&M and security costs. Renewable energy installations should remain robust, and in fact may enhance natural gas by lowering natural gas pipeline over-capacity issues. Rumors of low seesaw natural gas prices hurting renewable energy deployment is unfounded and over-exagerated. Professor Brown has nicely outlined the key policy choices for energy going forward. The replies so far have come from regular contributors and reflect their continuing thoughtfulness on the subject. Still, several issues come to mind. The first is that the displacement of coal by natural gas has been the signal success in reducing CO2 emissions. The ill-considered attack on hydraulic fraccing by environmentalists and Big Coal – strange bedfellows, indeed! – has succeeded only in delaying its employment in Europe. We are now led to believe that exporting the windfall to those same recalcitrant Europeans is a policy of choice. As we would thereby sharply increase the domestic price of natural gas (http://www.energycentrist.com/2013/03/20/how-large-is-the-gas-surplus/) and drive up the U.S. development activity only begs the question “Why would we want to do that?” Rather than diminish the domestic supply of natural gas along with its economic stimulation, we should press the bet and look toward NG-derived alcohols to displace refined crude oil products as transportation fuels. In that vein, the coal no longer being burned to generate electricity should be converted to fuel oil to further reduce our dependence on hydrocarbon imports. Nuclear reactors make a great deal of sense. Much of the cost is due to our country’s rather singular anti-nuclear neurosis. We have increased costs through gold-plating various safety concerns, through a regulatory process that appears designed to minimize nuclear development and by irrational fears – as opposed to those fears of nuclear which are well considered – among the public. These seem to be fed by various anti-nuclear factions to the detriment of the country’s energy planning. If these problems and the waste disposal issue could be mastered, we might see an increase of the nuclear resource similar to France’s. Finally, conservation is the only ultimate solution. We live in a closed system. The biosphere acts as a heat pump, employing solar energy to recondition the air and move our effuvia to the abyssal depths. It necessarily has a finite capacity to do so. Ultimately, we’ll need to estimate that capacity and assure that as a global aggregate our emissions remain below it. The Laws of Thermodynamics are allowing of no other outcome. What a thoughtful conversation! With respect to Dr Brown’s final question, some recent modeling efforts by EIA have suggested there is a strong chance that a sustained low price for natural gas (ie, beyond 2015) will reduce renewables deployment. Making the critical steps to reducing emissions from energy consumption should follow the steps we’ve known for quite some time; reduce consumption without harming quality of life through efficiency, then decarbonize. If the models projections are worth their salt, natural gas can be a good partner in the transition, but we will need a directed policy to make sure emissions reductions continue to advance. A carbon tax or a national RPS (preferably, an energy portfolio standard that allowed verified efficiency gains, without a cap on efficiency contributions) would be good available policy options. The carbon tax has obvious economic efficiency appeals, but I worry that our politicians are incapable of instituting a tax at a high enough level to establish a proper incentive structure. The RPS may be more politically feasible; many will no doubt interpret this as continuing down the path of second-best policy options. And those uncertainties have a tangible impact on the path of development. Domestic nuclear power development is now virtually stagnant — not simply because of the anxieties triggered by the Fukushima disaster, but because natural gas now offers a more affordable and easier alternative. While it seems plausible that lower cost energy may reduce interest in energy efficiency, the reverse is also in evidence: Declines in overall energy consumption and in the economy’s energy intensity resulting from improved efficiencies have tempered demand for new generating capacity and other forms of energy production. Sequestration points to diminished government capacity to subsidize ‘renewable’ energy sources that are not otherwise competitive. In the absence of a cost-effective means for system-scale energy storage, solar and wind power remain for the most part too costly and unreliable. Low natural gas and other energy costs have been attracting manufacturing back to the US. That offers at least the hope of increased employment in the face of what so far has been largely a jobless recovery. Given the unfolding economic benefits of cheaper, more abundant domestic energy supplies to an economy still in the doldrums, policies aiming to raise energy prices to “internalize externalities” are unlikely to garner much political support. Lewis makes a good point about the stagnation of domestic nuclear power with natural gas being easier and more affordable. It isn’t just nuclear, however. The low cost and comparative cleanness of natural gas are making it difficult to advance other important technologies as well. The victims include large-scale energy storage technologies of the sort that will be needed to make renewable energy reliable, and technologies that can capture carbon efficiently without the parasitic energy drain that current post-combustion technologies impose. Candidates include molten carbonate fuel cells, oxyfuel combustion, and chemical looping processes. It would be one thing if the cheap natural gas that North America currently enjoys were a long-term resource that we could depend on for centuries of cheap energy that we could burn through with no adverse consequences. But it’s not. It may emit only half the carbon per megawate-hour compared to coal, but that’s like cutting the rate of blood loss from a severed artery by half. It may be progress of sorts, but if left at that, it just means taking a bit longer to die. The energy technologies that are hampered by cheap natural gas do include energy efficiency and conservation. I’m skeptical that there have been significant advances in those areas beyond what is economically motivated by the cost of energy. Yes, energy consumption here has declined, but how much of that is really due to improved energy efficiency, as opposed to growing poverty and loss of jobs? It’s probably true that economic efficiency, measured in terms of dollars of GDP per unit of energy, has been “improving”. An increasing fraction of GDP has been going into the security, legal, financial, and entertainment/marketing sectors. Those are all pretty low energy consumers. The big energy guzzlers are heating and air conditioning and transportation. There’s been little real progress in those areas that I can see, beyond incremental gains in fuel economy under the goad of high fuel prices. Mostly it seems we’re just driving fewer miles, because so many of us are no longer working. I find the conclusions of the Citi Research report problematic. They’re correct, insofar as increasing penetration by renewables creates an enormous problem for balancing electrical supply and demand (i.e., generation and load), and gas-fired peaker plants are currently the most cost-effective solution to that problem. To the extent that they are a solution, gas-fired peakers can be said to enable increasing penetration by renewables. Conversely, increasing penetration by renewables does drive an increased demand for gas-fired peakers. So the report is superficially correct about that. The inefficient use of capital resources that reliance on peakers represents is no problem for investor owned utilities. Regulations under which they operate typically give no incentive for efficient use of capital, as costs are passed through to the rate paying public. Those are dubious reasons for the economic appeal of gas-fired peakers as “solutions” to the problem of intermittent renewables. But there are other factors that count against them as well. They are not properly a “transition path” to an ultimate non-fossil energy economy. On the contrary, they would limit penetration of renewables to perhaps 35%. That’s about the maximum fraction that could be supplied by renewables in an energy economy of renewables backed by gas peakers. To go higher than 35% would require a massive build-up in long distance transmission capacity, large-scale energy storage and / or large-scale responsive load capacity. But long distance transmission is expensive and hard to get permitted, and energy storage solutions are hard to develop in the face of competition from peakers — at least under current game rules. That leaves responsive load capacity, but that has its own costs and limitations. Perhaps the worst part about the rush to gas as a “solution” to intermittency is that any capacity that is put in place today will become locked in by the simple fact of its existence. Why scrap an already paid for and perfectly functional gas peaker for an energy storage system of eqivalent capacity? All this is not to say that there aren’t any available solutions that would allow us to move entirely away from fossil fuels by 2050. There are a number of them. But cheap natural gas is an obstacle they will have to overcome, and no help in the long term. 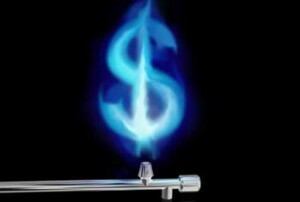 Even with moderately priced natural gas, energy efficiency is still often the most cost-effective “source” of energy. Utility regulators should remove the “throughput bias” frequently present in utility rate structures by implementing “decoupling” and related rate designs that make the utility financially indifferent to volume of energy sales, so they will not be biased against energy efficiency programs. Utility regulators can also require that utilities look to all cost-effective efficiency and demand response options prior to seeking additional generation and transmission. It is true that low cost natural gas will affect the benefit-cost ratio of energy efficiency measures relative to new supply whether one is speaking of utility planning or individual businesses and households (e.g., is it worth me paying more for the condensing furnace? or adding more insulation?) but even so, efficiency and demand response measures are underutilized. Further, utility benefit-cost testing often omits non-energy benefits and social or externality costs–such benefit-cost testing approaches (including the frequently employed Total Resource Cost test) should be revised. The further intertwining of natural gas and electricity systems; increased penetration of variable resources such as solar and wind; growing demand response; distributed generation opportunities; new, more responsive fossil fuel generation technologies; and greater attention to energy security and reliability underscore the need to implement smart grid technologies (on both sides of customer meters). This requires not only technology but also attention to business and regulatory questions (allocations of costs and returns and legal responsibilities) and good communications to convince the public of tangible benefits that will accrue to them (while allaying concerns they have, whether reasonable or fantastic). Let’s use our newly available abundance of natural gas judiciously and not be like a lottery winner who squanders his/her good fortune and ends up bankrupt.